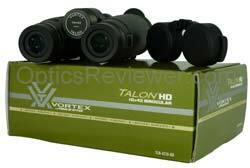 Vortex Talon HD binoculars. How good are they? The reason for using HD glass, sometimes called extra-low dispersion (ED) glass, in making binocular lenses is the essentially the same reason for making them with fluorite or using aspheric lenses. They enhance color, contrast, and resolution by reducing chromatic aberration. To say it differently, HD lenses provide a cleaner, crisper, clearer view by significantly reducing the blurring at the color edges between light and dark areas in an image. While improving the view across a range of circumstances, this is perhaps particularly helpful in low-light conditions when details are more easily blurred. Let's get on to what we found for this Vortex Talon HD 10X42 review when we opened the box. The Vortex Talon HD's frame is made of aluminum for a lightweight, corrosion-resistant instrument that's light enough for carrying on a hike or longer foray outside. At just 26.5oz/751g, we feel that it's light enough to be comfortable while still providing enough weight to reduce minor hand movements often associated with particularly light weight instruments. (No — we couldn't find any information on what the chassis was made from, so we asked the nice folks at Vortex and they said it was aluminum.) July 2013 update: Vortex now lists the frame material as magnesium on its web site. Vortex placed thumb rest indents at an angle - presumably to help guide one's hands to achieve a balanced, less fatiguing grip and place the focus wheel under the index finger. However, when trying to use the grip position we felt was prompted by the thumb indent angle, it seemed to put the index finger on the focus wheel at an angle approaching from the front of the binoculars. Maybe we were not adaptable or perhaps we were simply stubborn, but we found ourselves ignoring the angle of the thumb indents and didn't notice a significant amount of arm or hand fatigue. The standing height of the Talon HD 10X42 is 6.7 inches (17.0cm) - about average for a full-size binocular. The width is five inches (12.7cm) and the open-hinge design allowed two fingers to fit comfortably between the barrels. While some feel that the open-hinge design is more comfortable and easier to maintain a grasp of, we've found that we're able to easily use and enjoy binoculars with either the open- or closed-hinge design. You may have a preference for one over the other. The rubber armoring on the Vortex Talon HD has the "normal" hard surface that will prevent metallic noises when bumping against a tripod or other metal and provides a better grip in cold or wet weather, but won't do much to protect the instrument from injury should it drop from a height or slide from a truck seat to the floor during a sudden stop. Of course, rubber armoring isn't intended to give that level of protection to precision optical instruments! While it's not the function of a binocular's rubber armoring to provide waterproofing, the Talon HD is both waterproof and internally fog-proof. It's sealed with O-rings and moisture containing air molecules have been replaced with argon gas inside the instrument. As long as the seals keep humidity out, the Vortex Talon HD is protected from both short-term damage from moisture as well as long-term damage to the prisms and lenses from fungal growth. Of course, if you only use your binoculars in an arid area or from inside a vehicle or building, waterproofing won't be of particular interest! If you are in an arid region, though, you'll want to remember that waterproof binoculars also keep dust out. The eyecups are of the twist-up, twist-down variety typically found on binoculars of better construction. They have an intermediate stage, at the halfway extended point, which is easily found because of a detent stop. It was enough to keep the eyecup from unintentional changes during our testing, although they had a bit more movement than the Viper HD's eyecups (this is something we feel Vortex would do well to improve to the level of the rest of the binocular's overall build). With an eye relief of 16.0mm, and each of the eyecups' two stages providing 3mm increments, the eye relief should be comfortable for most users. The edges of the eyecups are slightly beveled and we didn't find them to be at all uncomfortable for those who didn't wear eyeglasses. The focusing mechanism was as smooth as you would want and expect it to be. It was "buttery smooth." That aspect was fine and good. However, we prefer for a center focus binocular to go from close focus to infinity in about a full turn of the focusing wheel. This is because it allows for rapid changes of focus in tracking a bird in flight or a startled and swiftly moving deer, zebra, kangaroo, horse, or person for example. Changes from a nearby view to one more distant, occur frequently when using binoculars and are easier/faster and less tiring when able to minimize the movement necessary for adjustments over an extended period of observation. We'll accept as much as 1.5 turns as reasonable. We cheerfully acknowledge that there are some who prefer about 1.5 turns, though, because they feel it provides the ability to achieve a finer focus! 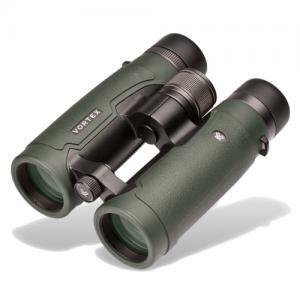 The Talon HD 10X42 we purchased for this review took 1.75 turns to go from close focus to infinity or a bit more than we ask for in a binocular. Of course, the other side of the coin was that our sample was a bit easier to achieve a fine/precise focus with, however we would still prefer a faster focus because it would be less tiring when using it for extended, active observations. Is that extra quarter turn enough to take the Vortex Talon HD out of consideration? That's going to have to be your call based on how you expect to use your binocular. Like most companies producing goods in today's economy, Vortex works globally with optical component manufacturers and assembly plants, including Japan, Korea, China, Taiwan, and the Philippines. The instrument we bought for this review had small sticker on a barrel that said it was made in China. We found the craftsmanship used in the Vortex Talon HD's construction and its mechanical performance to be quite good. You'll want to read our review of this binocular's optical performance and our overall recommendation. We'll move this Vortex Talon HD 10X42 review away from chassis and body characteristics and on to optical configuration and performance now. The linear field of view for the Vortex Talon HD 10X42 is 348 feet at 1,000 yards (116.4m at 1,000m). At a 6.6° angular field of view, it's above average for its configuration. We like a wider field of view because it offers the user a better view of activity and increased opportunity to see action that would otherwise be missed. The Vortex Talon HD's usefulness across a wide spectrum of observing activities is enhanced by a wider than average field of view. We unashamedly like this attribute of the Talon. We found that the optical sweet spot in the center of the field of view was nice and large. That's where an image will have the most detail and the colors be clear, bright, and well contrasted before becoming fuzzy or blurred as you get close to the edge of the field of view. The unit we bought for this Vortex Talon HD 10X42 review appeared quite clear for about 80% of the radius before the periphery of the view started to get fuzzy. This is relatively normal and shouldn't be considered a negative against the binocular. Are you likely to notice this while using a Vortex Talon HD? We don't think so. We were not conscious of it in the field and were only able to see it well enough to measure it by using specific optical devices. 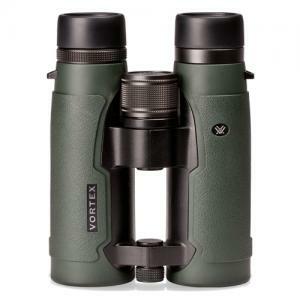 The Vortex Talon HD 10X42 resolved details to an uncommon degree when compared with optics lacking the dielectric prism coating and HD glass or aspheric lenses. While a handheld view is quite good, the normal, slight movements of your body will not allow you to see the full effect of the Talon's view. We recommend using a tripod with the optional tripod adapter when possible to get the full benefit of the Talon HD's optics - much as with spotting scopes. When you first look through the Vortex Talon HD, you're not likely to discern the full impact of its optics. However, after using the Talon or its similarly equipped siblings, you'll note a distinct difference in the view when using "old standard" (what else to call them?) optics. What's the reason for the view being better than some other roof prism binoculars? We suspect it's a combination of the fully multi-coated optics, which includes Vortex' proprietary XR anti-reflective coating, the dielectric prism coating, and the high density/extra-low dispersion lens glass which prevents much of the blurring of details associated with chromatic aberration. We were not able to see any chromatic aberration under field conditions. The diopter adjustment is provided as a ring at the base of the right ocular lens. It will adjust the binocular for the difference between the user's eyes and adjusts somewhat stiffly. The stiffness is a feature and not a negative, since the diopter adjustment does not lock on the Vortex Talon and the stiffness helps to keep it focused. You'll want to check it from time to time to ensure that regular use and handling of the instrument hasn't resulted in a changed diopter focus. The exit pupil for the 10X42 configuration is 4.2mm and quite adequate for most land-based uses. At that size, however, it would likely pose problems for someone trying to use it on a rocking boat. The 8X42's larger 5.25mm exit pupil would make it easier to keep maintain a view, but still may not be adequate. To be fair, we don't believe the Talon was designed to be used on marine vessels in rough water and we simply note that a larger exit pupil would be preferable for use in those conditions. We found the colors viewed through the Talon to be neutral. It was easy to distinguish between shades of various colors. The edges of the colors were well-defined and there was no question where one stopped and the next began. We did not observe chromatic aberration either during clear days or at night under field conditions. We found that the Vortex Talon's fully multi-coated surfaces, BaK-4 prisms with dielectric coating, and high-density lenses provided very good penetration of shadows when viewing from sunny and well-lighted areas. They were capable at dusk and dawn, as well, and provided bright views (that means bright colors, good contrast, and crisp resolution) up to the last few minutes before nightfall. We found that at times it difficult to achieve a good view when looking across sunlight striking water at an angle. As the morning sun was climbing in the sky and we were looking north or south at water fowl, there would be a usually brief period when a glare prevented seeing the image clearly. This would seem to relate to the Talon HD's baffling to reduce stray light in the binocular's barrels. This is true of many binoculars, however, and the conditions of intended use should be a guide as to whether or not it might influence the purchase of the Talon. Our Vortex Talon HD 10X42 included a padded soft, black nylon case. The padding seemed about a quarter-inch (6mm) thick and reminded us of the closed-cell foam often used as padding for notebook/laptop computer travel cases. Inside the cover is a mesh pocket with a zipper on one of the long sides - an ideal place to carry lens cleaning tissues. There are two sturdy belt loops stitched on the back of the case in addition to the shoulder strap which attaches to the sides of the case. The case is not a particularly snug fit for the Talon, so if you wanted to slip a pair of thin gloves in for extra padding while traveling and possible use during the day, it should work just fine. The Vortex Talon comes with a rain guard for the ocular lenses (eyepieces) which is made of a softer, durable-feeling rubber that's about an sixteenth of an inch (1.6mm) thick. This is another of the Talon HD's aspects which we like a lot - it just feels as though it's made of a high-grade, durable rubber. It has a flexible bridge between the two caps that fit over the oculars. The caps that fit over the oculars appear to either have a slight taper or enough friction so that, while they fit easily, they don't usually slip off easily accidently. The caps measure about three quarters of an inch (19mm) deep. Covers are also provided for the objective lenses and appear to be made of the same type of rubber as the rain guard. They fasten to the binocular by means of a loop sliding over the end of the barrel - from which the lens covers hang when not in use. While we like the quality of these lens covers, see their benefit and doubt that anything would happen to them in normal, we're also mindful of the possibility of their dropping off the end of the binocular during a vigorous day outside. We found that sliding them off at the beginning of an outdoor and tucking them into the carrying case saved them for another day. Also included with the Vortex Talon was a comfortably padded neoprene neck strap. Shoulder harnesses are now available from numerous retailers, should you find them more comfortable or practical. A lens cleaning cloth was part of the package - a nice touch for when you need something in the field and nothing else you have with you will quite do. And, finally, an instruction pamphlet which describes a variety of important things such as adjustments to the instrument's eyecups, interpupillary distance, and diopter. It also gives good lens care guidance. While they aren't the same price, the Talon HD and Viper HD are close enough in price that visitors to OpticsReviewer.com were interested in a side-by-side comparison. We pulled out most of our opinions and non-essential information and tried to present just what we felt were the more significant things we found in working with the Talon HD, Viper HD, and for good measure the Razor HD. If you're wondering what we noted, it's in the Talon HD vs Viper HD vs Razor HD article. Notwithstanding our thoughts on the couple of areas we think could be improved, we believe that the Vortex Talon HD provides above average optics and mechanical construction in its price range. We recommend it for a broad range of applications, including birding, general wildlife observation, sports/concert events, hunting and more. We feel confident that the optics and mechanical construction will provide a long life of use with only reasonable care. Of course, there's always the Vortex warranty, too. Consumers who have purchased and use the Talon HD rate it with 4.5 to 5 out of 5 stars. 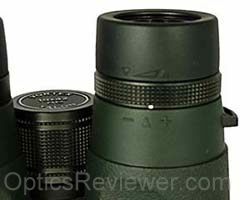 Vortex refers to its optics warranty as its VIP (Very Important Promise) and it's transferrable. You don't need a receipt or a registration card. 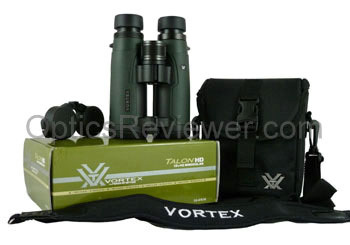 Should you ever have a problem with a Talon you purchased, received new as a gift, or were given as a handed-down gift, Vortex will repair or replace that binocular at its option. We don't know of a better warranty. Life is real and we can't always have what we want! If the Talon HD is a bit more than can be budgeted for, we recommend considering Nikon's Monarch ATB.